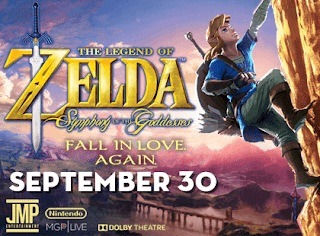 The Legend of Zelda: Symphony of the Goddesses will have a momentous new show this September, we're telling you now, because even with it being months away it could sell out. Check out all the official info below. The Legend of Zelda: Symphony of the Goddesses is returning in 2017 and coming to Hollywood with an updated orchestral adventure! The show will feature an all new movement from Skyward Sword, a much-anticipated Breath of the Wild arrangement, and the return of a classic that might just make some wishes come true! Celebrating 30 years of stirring virtual adventure and memorable soundtracks with live orchestral renditions directly approved by franchise producer Eiji Aonuma, The Symphony of the Goddesses is now in its fourth season. The two-hour concert comes to life with a 66-piece orchestra, 24-person choir, and a reimagined score that draws from recent and requested Zelda games, including A Link Between Worlds, Twilight Princess, and the remake of Majora’s Mask, while still paying homage to such classics as Ocarina of Time and A Link to the Past. The concert’s five-movement symphony regales ears with Nintendo composer Koji Kondo’s original music, recalling moments of Link conquering dungeons, running through forests, and struggling to decide what color tunic to wear. Throughout the evening, a video collage syncs up with the adventurous tunes to spotlight exciting moments from the venerable franchise.